Juicy mushrooms and sweet peas, served on easy ravioli in a buttery Marsala sauce. 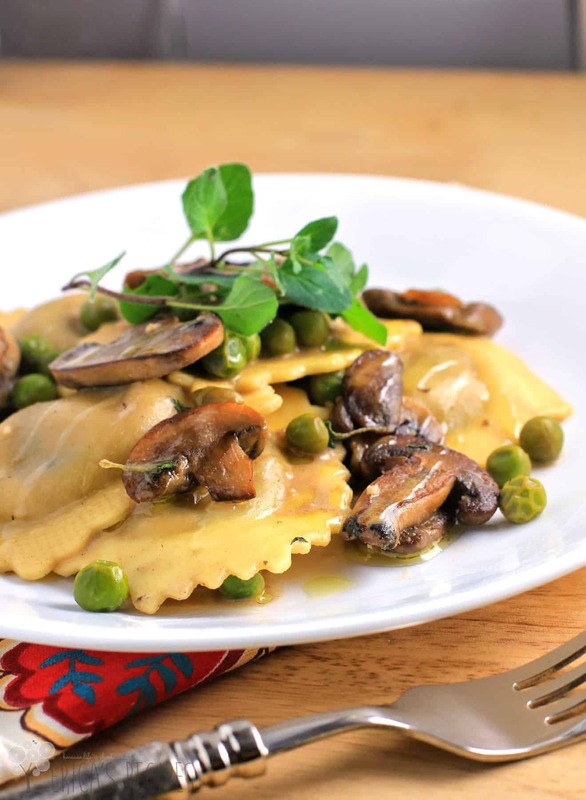 Ready in minutes, this Simple Ravioli Marsala with Mushrooms and Peas dinner is date-night perfect. Hmmm. So where to start… what little catch phrase should I use… “And in the easy weeknight category, we have this little number…” or “If I served you this, would you be my Valentine?” Because I made this on a weeknight for my family – and we loved it, especially my husband. But the more I look at these photos, I’m just feeling a little romantic. Like, add a glass of wine (instead of the cup of milk I actually did have), some music, lighting, a sweet dessert …do you see it too? 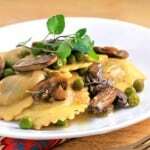 I used a chicken and marsala ravioli for this recipe, but any ravioli would work particularly if you want to keep it vegetarian. This dinner is ready in literally just a couple minutes, and the leftovers even reheated well the next day. Life is complicated enough, so it’s always nice to have a good little recipe like this at our disposal don’t you think? For a busy weeknight or a date-night! Meanwhile, heat a large nonstick pan on high heat. Add the butter and mushrooms, and saute, tossing occasionally, until mushrooms are well browned. Add the wine and deglaze the pan using a wooden spoon to scrape up the browned bits. Reduce the wine just a bit to cook off the alcohol. Remove from the heat. Cook the ravioli according to package directions. Add to the mushrooms and Marsala. Add the peas, oregano, and a pinch of salt. Serve immediately, drizzled with olive oil. Yields 4 servings. Anything with mushrooms sings to my heart!! Thank you for sharing 🙂 Looks so good! My co-worker loves mushrooms. I’ll have to share this recipe with her. We love our ravioli! This looks delicious 🙂 I would have to go with the mushroom ravioli, its my fav! This sounds absolutely delicious! A nice twist on the traditional (and sometimes boring) ravioli that I’m used to having! How mouth wateringly Delicious. I am going to add this to my list of recipes to try! This looks like a quick and really delicious meal that I could make on weeknights! 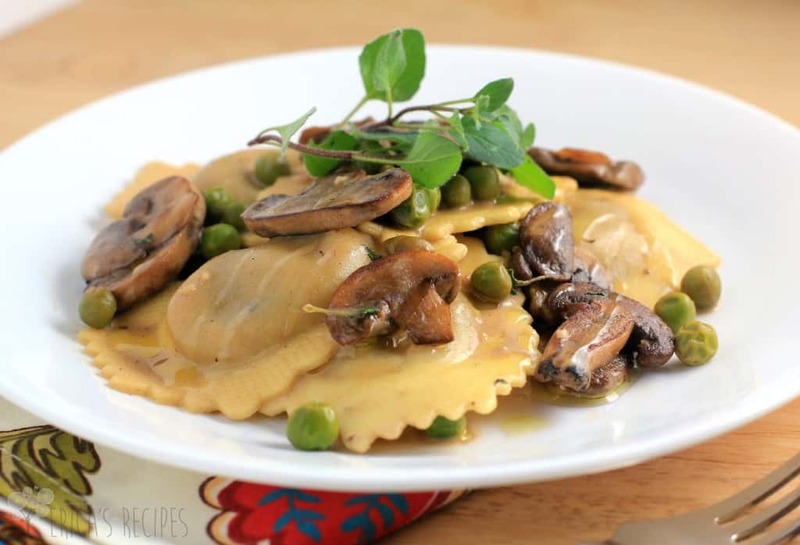 Wow this Ravioli looks outstanding– I adore mushrooms and like peas so I am going to have to make this ASAP. I love the sauce you made for the ravioli. Mushroom and peas are some of my favorite vegetables. The idea for the glass of wine – perfect! That looks so good. I love Marsala chicken and would have never thought to make it with ravioli. Yum, this looks so totally awesome. My husband would love it too. This sounds so good! I’ve had a sudden craving for mushrooms as of late! This will be perfect! Okay, mushrooms are one of my favs right now. They are so filling! This looks incredible. 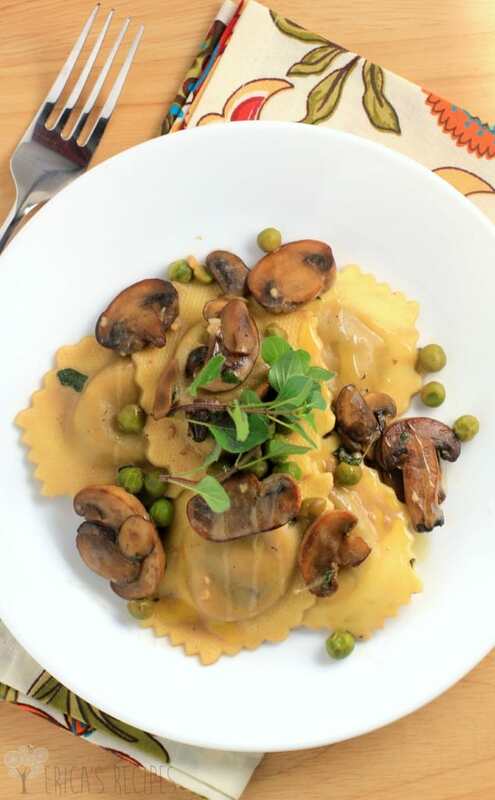 I love marsala chicken so I know I will love the marsala ravioli recipe. Pinning! I have yet to try any of the pre made ravioli with chickeb, etc in it. I really should. This dish you whipped up sounds really good! This looks amazing!! I’m in love with the fact that it started out as frozen ravioli! That’s amazing! This looks delicious Erica. It looks beautiful. This seriously looks decadent! The mushrooms totally make it 🙂 They are my fave! Oh man! This sounds amazing! I love mushrooms! I fall in love with anything with mushrooms – this recipe would be perfect for me! This is just a gorgeous dish Erica. So impressive and would be wonderful to serve dinner guests! Yum! That looks so good. I know what I’m having for supper tonight. “Life is complicated enough, so it’s always nice to have a good little recipe like this at our disposal don’t you think?” yep, yep and yep. Thanks for the delicious recipe. I like that you offer an idea to make it veggie too. I will definitely have to try this soon!! So perfect for any occasion! Oh that is a very impressive looking meal. It’s totally guest-worthy. What a gorgeous pasta dish. We love ravioli! Oh my goodness- that looks beautiful AND delicious! Swoon! I want to try this, and I love that most of the work is done with the ravioli. Can you give us some idea of the size package of ravioli you use?